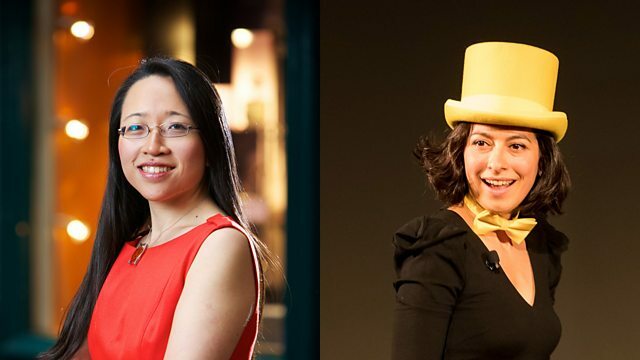 Two female mathematicians who bring the joy of maths to the general public in different ways. Calculator tricks and baking cakes - how two female mathematicians help people have fun with maths. Eugenia Cheng's aim is to rid the world of 'math phobia' and she uses baking to explain complex mathematical ideas to the general public, via her books and YouTube channel. For instance, she makes puff pastry to reveal how exponential growth works. Eugenia has taught Pure Mathematics at universities in the UK, France and US and is currently Scientist in Residence at the School of the Art Institute of Chicago. Her most recent book is called Beyond Infinity: An Expedition to the Outer Limits of the Mathematical Universe. Sara Santos engages the unsuspecting public in maths through a kind of street performance. Originally from Portugal, Sara now runs a company called Maths Busking in the UK, and tours festivals, schools and corporate events wearing a yellow top hat and doing maths for people's amusement. Her 'tricks' include tying people up with ropes and guessing their birthdays. Sara says the idea that only very clever people are good at maths is rubbish; anyone can do it. Teaching maths: a waste of time and money?